Gandhi Kathakar Narayan Desai, son of Mahatma Gandhi’s personal secretary and biographer Mahadev Desai passed away today morning at 4.00 am. His funeral procession will take place at 2.00 pm today in Vedchhi in south Gujarat. Shri Desai was born on December 24, 1924, in Bulsar, Gujarat. Brought up in Gandhi’s Ashram in Sabarmati, Ahmedabad and Sevagram near Wardha, He stopped attending school to be educated and trained by his father and other residents of the Ashram. He specialized in basic education, spinning and weaving khadi. After his marriage to Uttara Chaudhury, daughter of freedom fighter parents, Nabakrushna Chaudhury and Malatidevi Chaudhury, the young couple moved to Vedchhi, a tribal village 60 km from Surat in Gujarat, to work as teachers in a Nai Taleem school. Following the Bhoodan (land gift) movement launched by Vinoba Bhave, Narayan Desai traversed through the length and breadth of Gujarat, by foot, collecting land from the rich and distributing the same among the poor landless villagers. He started the mouthpiece of Bhoodan movement, titled Bhoomiputra (Son of the Soil) and remained its editor till 1959. Narayanbhai joined the Akhil Bharatiya Shanti Sena Mandal (Indian Peace Brigade), founded by Vinoba and headed by veteran socialist leader Jayaprakash Narayan (widely known as “JP”). As the general secretary of the Shanti Sena, Narayan recruited and trained peace volunteers throughout the country who intervened during ethnic conflicts and helped establish harmony among conflicting communities. Narayan Desai was involved in the setting up of Peace Brigades International and was elected as the chairman of the War Resisters’ International. He along with a Pakistani peace group were awarded the UNESCO prize for International Peace. Narayanbhai was active in the campaign against the imposition of emergency in India and brought out a magazine defying the censorship laws. As a close associate of JP, he played an important role in helping the newly formed Janata Party, a conglomeration of major non-Congress political parties in India, arrive at a consensus on the name of Morarji Desai as the Prime Minister. Following JP’s death, Narayanbhai moved to Vedchhi and set up the Institute for Total Revolution. The Institute imparts training in non-violence and Gandhian way of life. Narayan, as a way of paying tribute to his father, Mahadev Desai, wrote a four-volume biography of Gandhi in Gujarati, a dream his father could not fulfill in his lifetime because of his sudden death in prison on 15 August 1942. Narayanbhai started Gandhi Katha in 2004 to spread message of Mahatma Gandhi. His Katha is compiled in book form. In last phase of his life, Narayanbhai became Chancellor of Gujarat Vidyapith. Due to health issues, he resigned from the post from hospital in Surat. Post-hospitalization and some improvement in health, he was taken to Vedchhi. The Prime Minister, Shri Narendra Modi has condoled the demise of Shri Narayanbhai Desai. 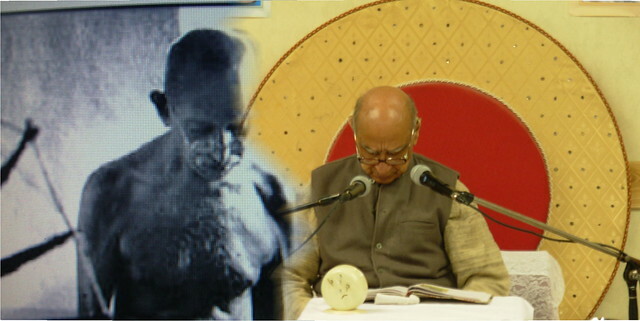 “Narayanbhai Desai will be remembered as a scholarly personality who brought Gandhi ji closer to the masses. Sad to hear of his demise. Rest in Peace”, the Prime Minister said. Shri Desai was given guard of honor with tricolor over his body. Gujarat Assembly Speaker, other political leaders from South Gujarat attended his funeral procession.